hey jen renee: All day, and all of the night. So what's a girl to do? I think I'm going to make a list, for starters. 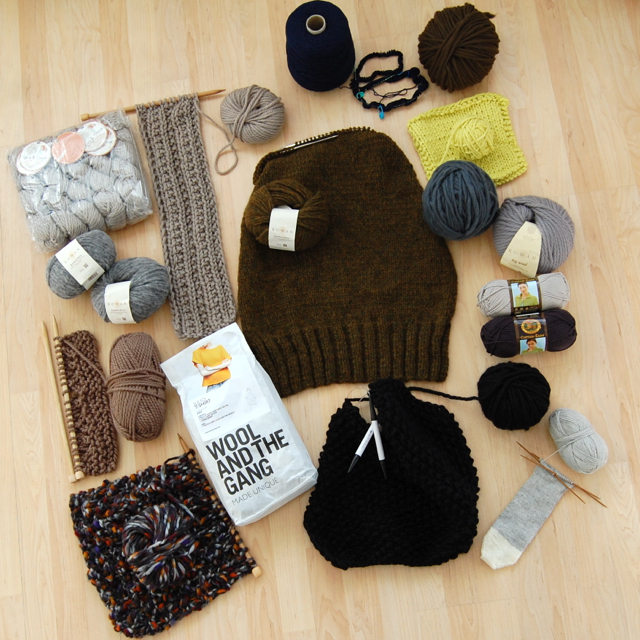 That Rowan sweater in the middle is going to be an awesome cardigan and I'm going to finish that first. And in about five minutes, I'm going to Google videos on 'lever knitting.' Because I heard it's fast. Knit fast, die warm, homies. I totally understand what you're going through! Today, I sorted through all my yarn boxes & discovered a whole bunch of experiments I just hidden away. Some, I think I might just give up doing in general. Such a dilemma! Keep on knitting on! Yes! I have 'experiments' too ... I never have the nerve to throw them away but I don't know what to do with them. Oh well, you're right - knit on! I am having this problem too! I have a ton of things to finish and even more projects that I can't wait to get started on. I need another set of hands to get all of it done. hahah...you know me with all my crafts...so I have totally been where you are now! For me - I usually tackle whatever is closest to being finished first, that way it feels like a quick win.